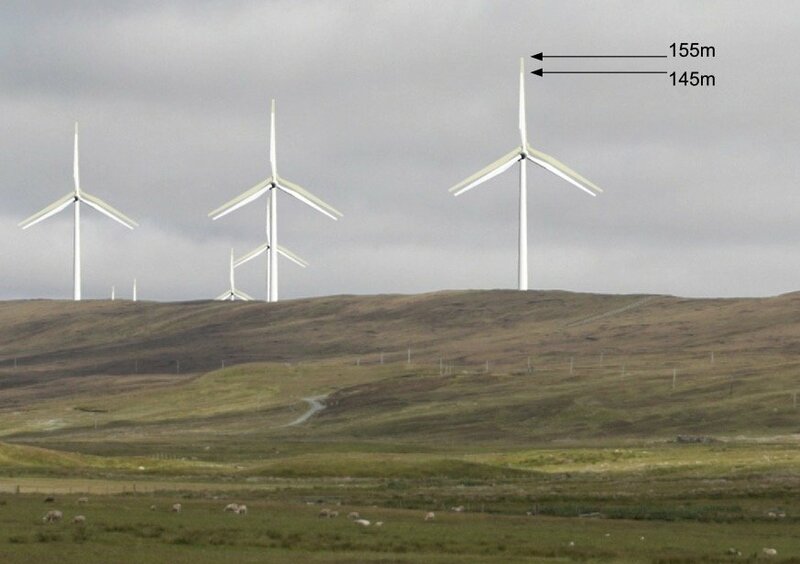 An artist's impression of the bigger turbines. Photo: Viking Energy. VIKING Energy will be applying to the Scottish Government to increase the size of the 103 wind turbines it plans to build in central Shetland. Viking says it intends to apply for a 10m increase in tip height variation to its planning permission to a maximum height of 155m. The rotor diameter will also increase by 10m to a maximum of 120m. The rotors will be moved 5m further up the turbine masts, maintaining a 35m ground clearance below the turbine blades. No changes to the area of the Viking Energy Wind Farm (VEWF) are proposed. Members of Shetland Islands Council were notified of the changes by letter. According to Viking, use of powerful turbines of 4 MegaWatts (MW) or more would enable the windfarm to increase its generation of renewable electricity to a level closer to its consented capacity of 457MW, increasing the potential income to Shetland Charitable Trust, which owns 45 per cent of the project. The letter to councillors says: “Turbine technology has moved on since Viking wind farm received consent in 2012. In the last decade, the annual electricity production per turbine has almost doubled. The planning variation is to enable Viking to take advantage of the best onshore wind turbines available and maximise the output of the site. Viking Energy plans to begin construction in 2020 with a view to completing the wind farm and connecting it to the proposed 600MW interconnector to the national grid in 2024. Exhibition materials will also be available to view on the Viking wind farm website www.vikingenergy.co.uk from Wednesday 3 October.